Calling all culture fans! Here are 9 attractions to enjoy during your visit to the UNESCO City of Literature, Dublin. Dublin is associated with four Nobel prize winners: WB Yeats, George Bernard Shaw, Samuel Beckett and Seamus Heaney. There are few cities in the world that care so deeply about the written word as this historic capital. Walk down canals, stroll through Georgian squares, and cross the river, and you’ll find heritage plaques dedicated to famous writers, bridges named after them, and literary place names aplenty. As yet, Bernard Shaw hasn't become prominent enough to have any enemies, but none of his friends like him. You may even notice a few of our writers lurking on street corners or hidden in parks, so keep your eye out for George Bernard Shaw at the National Gallery; Oscar Wilde in a louche recline at Merrion Square; and Brendan Behan watching over the Royal Canal. Dublin’s creative outpourings are well documented in excellent museums and galleries around the city. Bygone Georgian grandeur sets the scene at the Dublin Writers Museum, which details the city’s illustrious literary traditions up to the 1970s. There’s a first edition of Bram Stoker’s Dracula, Samuel Beckett’s phone, as well as letters, portraits and books. Nearby, the James Joyce Centre on one of Dublin’s most beautiful Georgian streets runs changing Joycean exhibitions, walking tours and lectures, as well as a permanent exhibition on Joyce's life and work. And to get an understanding of what was behind the actual production of Dublin’s newspapers, books and magazines, head to the National Print Museum, housed in a former soldier’s chapel. If there’s one thing you’ll notice about Dublin pubs, it has to be the conversation. Oftentimes, there’s no background music, no slot machines, nothing to distract from the pressing task of putting the world to rights. It’s why pubs have had both a historic and a current association with writers. As well as appearing in famous literary works, such as James Joyce’s Ulysses, Dublin’s pubs were frequented by some of the world’s most famous writers. There is no such thing as bad publicity except your own obituary. James Joyce liked to hang out in Davy Byrne’s; Neary’s was a favourite of Brendan Behan and Flann O’Brien; and Toner’s was the only Dublin pub visited by poet WB Yeats. You can find out all about the literary associations of Dublin pubs with the Dublin Literary Pub Crawl, which meets at the Duke, just off Grafton Street. The guides are actors, offering quotes, jokes and literary history during the tour, which lasts a little over two hours. Picking out one theatre above all others in Dublin is tricky – the Gaiety, the Gate and the Olympia have hugely enriched the city and have been around for longer – but the Abbey is home to the national theatre and helped create modern Ireland. Life seems to me a preparation for something that never happens. Founded by poet WB Yeats and dramatist Augusta, Lady Gregory, in 1904, the theatre has been at the heart of Dublin’s cultural life over the last century, and continues its aim of supporting and promoting new Irish writers and artists. The theatre has served to entertain, provoke and support in roughly equal measure. Incidentally, theatre in Dublin tends to be cheaper than in many other capital cities, making it a great night out that won’t break the bank. You can also take a tour backstage for an exclusive insight into this incredible theatre. The National Library contains a stunning reading room, and offers an exciting programme of exhibitions and events throughout the year. Dublin’s libraries are heart-stoppingly beautiful – inspirational paeans to the written word. Just look at Trinity’s Long Room, easily one of the most stunning libraries in Europe. Or how about Marsh’s Library, which has remained largely unchanged since its opening 300 or so years ago. When I die Dublin will be written in my heart. The Chester Beatty Library is a definite must-see and has been described as “the finest collection of manuscripts and books made by a private collector in the 20th century”. More a museum than a library, it includes over 6,000 items from East Asia and the west, including the earliest known copies of the four gospels. No literary trail would be complete without a visit. Dublin holds its independent bookshops close to its heart, and there are some wonderful little literary spots dotted around the city. Ulysses Rare Books on Duke Street is a magnet for bookworms and offers a fabulous selection of first editions of works by Joyce, Wilde, Yeats and Flann O’Brien. The Winding Stair mixes new books with second-hand selections in a beautiful store by the River Liffey – and even better, you can dine out there while poring over the classics. A wise old owl once lived in a wood, the more he heard the less he said, the less he said the more he heard, let's emulate that wise old bird. Stokes Books in the George’s Street Arcade, meanwhile, is a treasure-trove of rare and second-hand books, while the Joycean-themed Sweny’s Pharmacy, which was mentioned in Ulysses, is also excellent for second-hand books. Poet Patrick Kavanagh may have been born in County Monaghan, but he called Dublin home, and nowhere in the city will you feel his presence more acutely than by the Grand Canal, immortalised in his poem Canal Bank Walk: “leafy-with-love banks and the green water of the canal pouring redemption for me”. What appears in newspapers is often new but seldom true. This quiet, tranquil stretch of water was so beloved by the poet that a statue now sits on a bench at his favourite spot by the Baggot Street bridge. Take a book, take your time, and enjoy this beautiful stretch of calm right in the city centre. Dublin’s literary culture is a living, breathing entity, and the city still produces exceptional writers, including Anne Enright, Joseph O’Connor, Colm Tóibín and Roddy Doyle. They often converge to meet the public at Dublin’s literary festivals, with readings, events and incredible interviews – plus insights into their creative minds. There is nothing worse than the ambitions of a talentless person. Try the Mountains to the Sea Festival (March), the Dublin Writers Festival (May), the International Literature Festival (May), and the Dublin Book Festival (November). Just outside the city, the village of Dalkey also lights up in literary style with the Dalkey Book Festival every June. Could there really be anything better than a smooth tasting coffee served in the favourite café of of some of Dublin's greatest writers? Influenced by the grand cafés of Paris and Vienna, and with a famous stained glass façade, Bewley’s on Grafton Street has been a meeting point for Dubliners since its opening in 1927 – and for chill out reading time, this has to be the place to head. Poems, plays, novels and stories inhabit the personality of Dublin in a way that I have never encountered in another city. With names like U2, the Dubliners, Sinéad O’Connor and Glen Hansard, Dublin’s music legacy rocks. Meshing traditional classics with a buzzing modern design edge, Dublin is a seriously creative city. 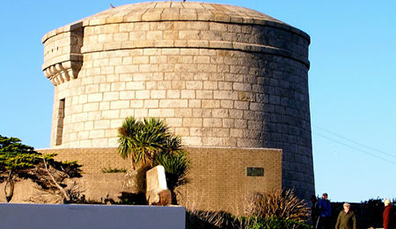 James Joyce, Dublin, Ulysses and Bloomsday – what have everything you NEED to know. Save 10% on the 2, 3 & 5 day passes! Holiday ideas, news, offers… sign up for our ezine and we’ll keep you in touch with Ireland. Follow in Yeats' footsteps through Ireland and see where this legendary poet found his inspiration. Dublin is buzzing with literary history, funky festivals, quaint pubs and a spectacular festival calendar. 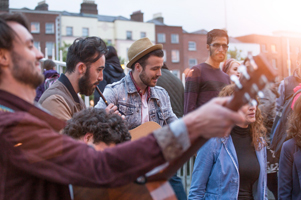 Whether you love literature, music, city-centre jaunts or seaside strolls, Dublin offers the best of both worlds. Dublin city, home to U2 and Joyce, is a capital of music, UNESCO City of Literature and fashion hub. The Dublin Discovery Trails app whisks walkers through Dublin’s main attractions history from Empire to Rebellion. 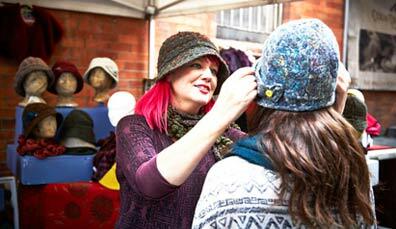 Dublin city is all style with boutique and high street fashion, fresh design influences and traditional crafts. Excited your interest? There are airports throughout the Island with international arrivals. Discover airlines flying to Ireland from your location. Don’t be a stranger. Keep in touch on Twitter, Facebook and YouTube. Lose yourself in some of Ireland's most inspiring countryside and vibrant cities. 10% discount on 7-day or 11-day self-guided hiking trips along the Kerry Way From €539 pp. sharing, including B&B accommodation, luggage transportation, route notes, maps & GPS tracks.